Today it barely rained during the day. And Sherie had volunteered to lead a “Century Prep Series” ride, so there was no escaping the responsibility for her. 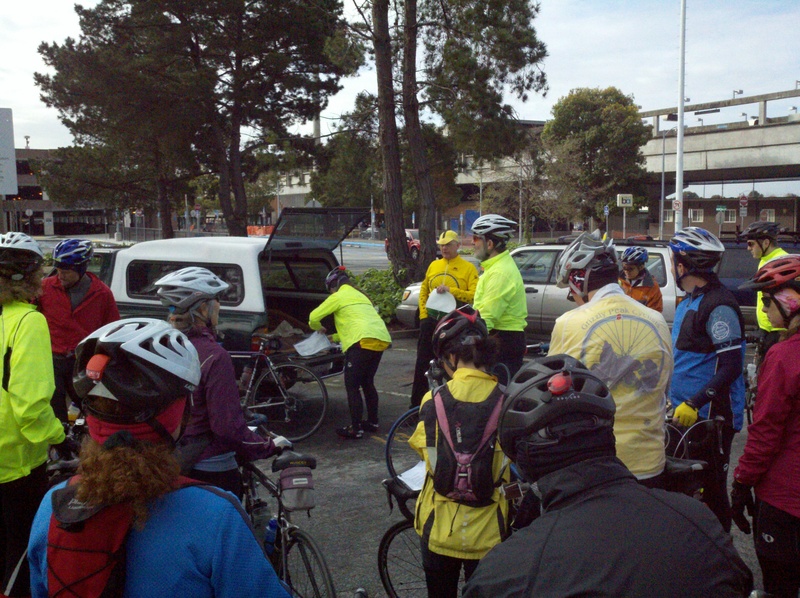 And when we arrived at the BART station parking lot, and saw familiar faces, it looked like it might be a great day to be back on the bikes after so much rain. And the “Three Small Walls” ride is a nice loop, one I can do repeatedly (and we do.) As the group gathered, some new folks introduced themselves to Sherie and the other two official leaders. Myself and some other regulars were also in GPC kit, so we were also de-facto leaders as well. When a larger woman rode in from the BART train, and announced she could make it slowly, and not to worry about her, Sherie and I looked at each other with dread. Sign in and map up! Ross and Sherie were the two to take turns “leading from the back” with the several slower riders. Now, to be fair, about half the group were pretty fast, well faster than the advertised T pace. Me included. So I made it my goal to climb the walls twice each, extra vertical for that Maratona Dreamer: me. And I even inspired a new rider (sorry, you know I am so bad with names), stronger than me, to twice climb McEwan with me. The first time he dropped me when it flattened a bit (you know, from 15% to only 12% or so) as I was at my reasonable heart and lung limit. The second time, he stayed a bit slower and I hung near his wheel all the way. The real inspiration was the ageless one, Chris Witt, with his laden touring bike, who we overtook on the second time up. As we approach, Chris was paperboying back and forth across the hill. But as we passed, Chris got on my wheel and hung there to the top. And my cardio was pumping and my legs were heavy. Meanwhile, Sherie had gone ahead while I had descended for that second lap and climbed that bonus five hundred vert. When we arrived at the school in Martinez, she was with the bulk of the group eating lunch on the benches. And most were ready to leave (and left) before I finished my PB&J and filled my bottle from the drinking fountain. Meanwhile, Sherie was playing phone tag with Ross and the stragglers. Her body was chilling from the long wait in the overcast gloom, and as a leader she really couldn’t just leave the stragglers with Ross bringing them in. Just as I was about to leave to warm up with an extra lap up Pig Farm hill, Ross rolled in with Debbie and Holly. And he had Ann with them, who had caught up from the back when she forgot her bike shoes at home and had to play catch up all morning after their retrieval cost her a half hour or more. While glad to see them all there, Sherie must have been a bit troubled because Ross had been the angel encouraging those not in shape for the ride to survive. So Sherie sent him and Ann away, and stayed with Chris and the newbies while they ate their lunch. Meanwhile, I went up Pig Farm by myself, then turned around and descending toward the east again. Interesting as I saw Ross and Ann pretty soon together, then much later Sherie and Debbie, then a bit later Chris and Holly. I turned around behind Chris and Holly and chatted with them going up the 1% to 2% easy approach very slowly, marveling how Chris could just mimic another’s pace and be so comfortable conversing to make the miles pass go. When it got a bit steeper, I just had to move out a bit and set off to catch Sherie. I was disappointed when I caught Debbie stopped by the roadside. Fearing that she had mechanical or other issues, I was relieved to find out she was “just resting after the hill.” Now the hill was a minor bump compared to what was ahead, but never mind. I chatted for maybe five minutes with her there as Chris and Holly rode by until I announced that I was cold and needed to move again. We rode together maybe a half mile when the road steepened for the “wall” of Pig Farm, when I just found a smooth pace and climbed up to find Sherie waiting at the crest of the hill. Looking back Chris and Holly were riding steadily if slowly, and Debbie appeared around the bend walking her bike up the hill. To shorten the story, I finally left Sherie with Debbie at the top of Pig Farm. I hammered off for home as quickly as I could, staying on course to bail any stragglers in might find. Glad I was to find no one by the roadside, just Ross playing with his cell phone in the BART parking lot. I reassured him to not feel guilty leaving the newbies and riding off; he had done his share getting them out to the lunch spot. Sherie and Chris were in control, and he had paid his dues for that ride leader credit. And I was so thankful for both of them for seeing out the ride for all, as the No Drop advertised event. And well amused by Chris’ great “Three Small Smiles” email in my inbox after dinner. Now, about the Century Prep Series. Toshi has organized the rides true to club history, and indeed through it quite a few riders are introduced to GPC and its century. Several riders today were on their first rides with our club, and getting ready for the century. And most of these kept up reasonably well and should be able to ride at least the “short” climbfest of the north loop. Indeed, only a few years ago, Sherie and I were introduced to GPC in this series, and Sherie had been the straggler who needed so much encouragement. As an aside to the main story: yesterday while it rained I took my drive train apart for cleaning. I had been thinking of adding lower gears for the Dolomites, so off I went with my nice Shimano 11-25 cassette and worn 40T middle chain ring. The Pedaler in El Sobrante has been the LBS of choice for Sherie and me, and I was surprised to walk in on a Saturday afternoon and find that the employees outnumbered the customers. It seems the rainy spring has really slowed down business for the bike shops. Lets hope that this year gets better soon for them, as last year was really tough with the economic conditions. Ron gave me full attention, and I ended up with an 11-28 Sram cassette for that one lower gear for the Dolomites. Plus a chain ring from a crank he took apart, new chain, gloves, sox, etc. Today I found that one lower gear nice on McEwan, and nice for slowing down enough to talk wit the newbies. But the second lowest gear, now a 24, is now that just a bit tougher than my old 25 for the familiar climbs. So maybe I will be faster using the 24 as I gain more climbing prowess this spring.